Whenever a chemical reaction occurs, molecules break bonds with each other and form new bonds with other molecules to create a new substance. We can usually see the outcome of this, but it is impossible to see the entire process with the naked eye. 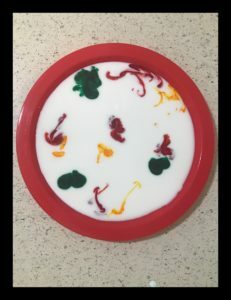 This magic milk activity will give you and your family a closer look into the movement of molecules during a chemical reaction, and it is pretty amazing to watch! Pour milk into the plate so that it fills the entire surface of the plate. 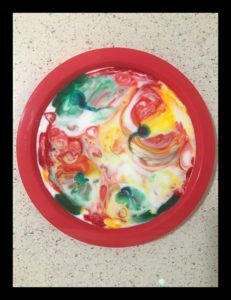 Drop a few droplets of food coloring into the milk in various spots. Do this for all the colors. 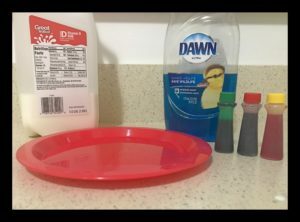 Drop one droplet of dish soap into each spot of food coloring. Watch as the colors begin to move throughout the milk! This science activity is a great demonstration of how soap works. You probably already know that the reason we use soap is to dissolve substances like oil and grease on our hands. This is because these substances are hydrophobic (repelled by water) and non-polar (unable to be dissolved in water). Milk is made up of water, vitamins, minerals, proteins, and fat. Although it is difficult to see with the naked eye, the fat and water molecules in the milk are separated because the fat oils are non-polar. On the other hand, soap molecules have both polar and non-polar heads, meaning that they can attach to both the fat and water molecules in the milk. Therefore, when we add the soap droplets to the milk, the soap begins to move throughout the milk by surrounding the fat molecules with the non-polar end of the soap molecule while the polar end attaches to the water. Thanks to the food-coloring, we can see all of this molecular movement in action, and we get quite a show!